Super Mario is the most famous video game character of all time. Mario has appeared in more than 200 video games since his creation. Anyways, I'm sure you'll enjoy making the Super Mario papercraft. The hands might be a bit difficult to build though. Here are two new C&C papercrafts. First is the GDI Pitbull and the other is a Scrin planetary assault carrier. Both are in pdo(pepakura) format. That steak looks delicious. Would you believe that it's made out of paper? You can build a paper model of that steak together with the knife, fork, plate and a raw meat at 1:1 scale. 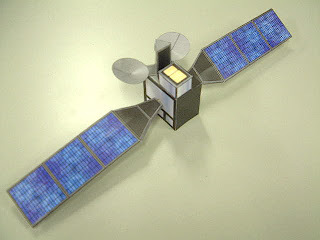 Here are some nice looking satellite papercrafts. The one on top is the ConeXpress from Dutchspace. The second site has the GPS and Compass satellites which are are about 10" tall and 12" - 16 " wide and will take 1 - 2 hours to complete. They will also add the Glonass and the Galileo in the future. What you see above isn't a virtual-reality image created on a computer. It's a “Fotomo” — a three-dimensional object you can pick up and hold in your hand. Created from photo prints of real-world scenes, cut and assembled into 3D collages, Fotomo are the work of Kimio Itozaki, a photographer with a unique perspective on life and art. This is a unique idea that you can do at home with your pictures. Download the parts for the fotomo above to unterstand how it works. Here's a nice looking jeep papercraft. You have to print two pages of parts. Canon has added some nice papercrafts today. 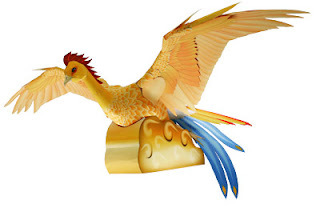 First is the Chinese Phoenix, a mythological bird, that is said to reign over all other winged creatures. It is known in Chinese as Fenghuang. The males are known as Feng and the females as Huang. They are said to be similar in appearance to a peacock. 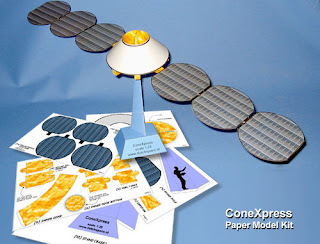 The paper model measures approx. 65cm in length and 60cm across. The other new models include the cute mobile featuring a family of elephants dancing among the stars and a papercraft model of Mt. Fuji showing the mountain's volcanic structure. A Roman villa is a lavish house that was built in the time of the Roman Empire. There are two versions of roman villa papercraft available for download. The first is a large, full colour version that needs to be printed on five sheets of A4 (including the base). The second model is smaller and requires only 2 sheets of A4 card. Two new Star Trek papercrafts have been posted at Paragon Cardmodels. The smaller one is the Hideki Class: The smallest of the Cardassian warships in service, they saw heavy use during the Dominion War. 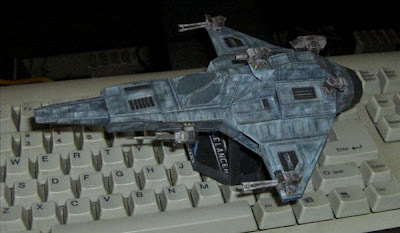 The other is a Groumall Type: The Cardassian freighter Gul Dukat used to capture a Klingon Bird of Prey after his demotion. Three lunar globe papercafts have been released by the National Astronomical Observatory of Japan. The smallest and the easiest to build is for beginners while the largest is for experts. The lunar map data were taken from the Japanese lunar explorer KAGUYA with its laser altimeter called LALT. The second Fuwa mascot Jing Jing is now available for download. Jing Jing represents the endangered species Panda. In a joint venture between The Rocketry Blog (Wayne Hill) and Eric Truax the M.A.G.P.I.E.s have landed for NSL 2008. What’s a M.A.G.P.I.E. ?…..It’s a Mining Android Geological Prospecting Ion Engine. The M.A.G.P.I.E. is a neat little paper rocket created by Eric Truax. It is perfect for those packs of A10-PT motors that are so readily available at your local Walmart. The M.A.G.P.I.E. NSL 2008 is a limited edition M.A.G.P.I.E created especially for NSL 2008 and WILL ONLY BE AVAILABLE FOR A LIMITED TIME (until June 15th)…so download yours now! Cowboy Beboy is an anime by Shinichiro Watanabe about a group of bounty hunters traveling on their spaceship, the Bebop, in the year 2071. Indiana Jones Adventure: Temple of the Forbidden Eye is a dark ride attraction at Disneyland. It is probably the best looking papercraft at Disney Experience to date. You have to print out 56 pages of parts. Temple of the Forbidden Eye: Height: 21" Width: 13" Depth: 16"
Snake Columns: Height: 6.5" Width: 2.5" Depth: 2.5"
Here's a simple ferry papercraft named St. Faith. 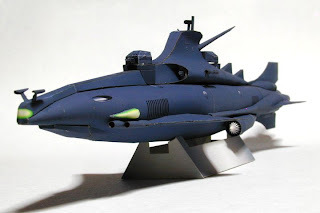 An AMX and a McDonnell-Douglas A-4 Skyhawk are the latest papercraftd from this Brazilian model site. Older models can still be downloaded including a Mirage 2000, Aermacchi MB 326, Mirage III, a Soyuz rocket, F-5, Fouga and Tucano. 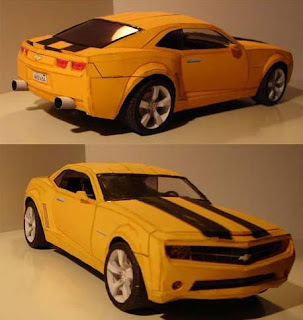 Claudio of paperinside has just posted Skip's awesome 1:12 Bumblebee Camaro Papercraft. You need to print 27 pages of parts. The TGV (train à grande vitesse, French for "high-speed train") is France's high speed rail service. 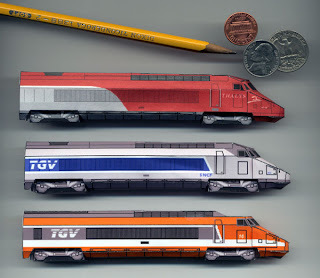 You can build the train models at 1/140 scale (1 meter = 20 pixels). Available for downloads are TGV PSE (Paris Sud-Est) original orange version, TGV PSE (Paris Sud-Est) blue Ligne de Coeur version, TGV La Poste, TGV Atlantique, TGV Thalys, TGV Duplex, AVE / Euromed (Spanish TGV), KTX (Korean TGV), Speedrail (Australian TGV), Acela Express (USA) & an Undecorated TGV. Check out these three nice looking papercrafts you can download from Orlik. You'll find a 1:25 Maxim wz. 1910(heavy machine gun) used by the Russian army during World War I, a 1:43 Mercedes Benz AG military ambulance and a 1:87 bus from Jelcz, a Polish bus producer. Caterpillar (commonly referred to simply as CAT) is, according to their corporate website, "the world's largest manufacturer of construction and mining equipment, diesel and natural gas engines, and industrial gas turbines." You can download a D4D bulldozer and 2 excavator (305 CR & 320 C) papercrafts. Here is the latest papercraft from Dr. Shazam of papertoy bonanza. This 4th Sparky takes him out of the usual matchstick format, and into new territory. Classic Hood Ornament territory. 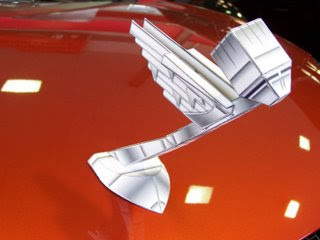 In the 1920's and early '30's , hood ornaments represented car style, elegance, and class. There were some chrome works of art attached to cars back in those days. The newest papercraft from daredevilbr is Tetra, a female captain of a pirate ship in the game The Legend of Zelda Wind Waker. This cool papercraft has five pages of parts and stands at 27 cm. Check out these cute animal papercrafts from the American meat website. The pdf file includes the cow & calf/pig & piglet, fence and the grass. Here's a simple papercraft of what looks like an Automated Teller Machine. Look for the link named craftark.pdf. 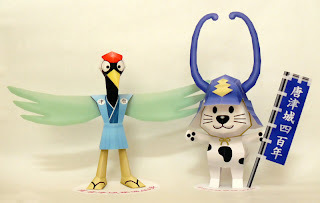 Check out these simple papercrafts from the Aichi Prefecture police. There are 2 simple cars and a motorcycle. Here'a a simple WCV(waste collection vehicle) or garbage truck papercraft with a trashcan and a garbage collector standee. It is from the website of Nerima city, one of the 23 special wards of Tokyo, Japan. Are you good with graphic designs? Damien from Australia needs you. 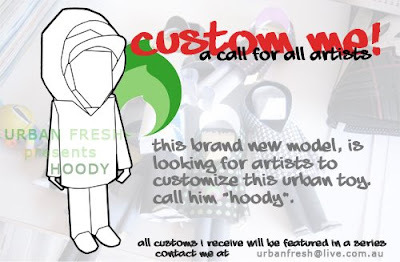 Email him for the blank template of his latest urban papertoy and customize it. 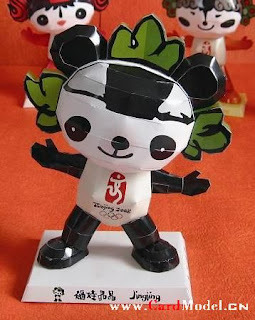 Two cute Japanese papercrafts have been posted. According to the translation, these models were made to commemorate the 400th anniversary of the fortification of the Karatsu Castle. The castle was built between 1602-1608 in the city of Karatsu, Saga Prefecture, Japan. These papercrafts have five pages of parts each. Tubbypaws has a new papercraft out. The model is made out of blocky building, human and car parts. This'll be fun to build. Here's a nice looking tank papercraft with an ancient Greek mythology theme. There are seven pages of parts. Two fashionable Hermes handbag papercrafts are up for grabs. These are available for a limited period of time only. Japan Real Estate Investment Corporation is a major corporation which owns high quality buildings. 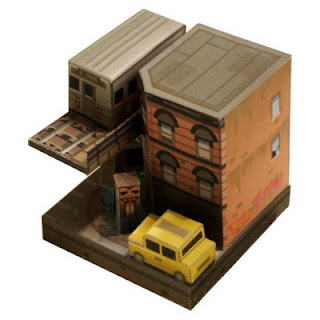 On their website, you'll find this well detailed hi-rise building papercraft at 1:500 scale. Click on the 2 green box links to find the parts(9 pages) and the instructions. James Bowen has created several super deformed models called Ham Headz since the shape of the head resembles a can of deviled ham. There are currently ten super heroes you can download namely Spider-Man, Iron Man, Wolverine, Captain America, Thor, Rogue, Gambit, Hellboy, Duke Nukem & Deadpool. More of these will come out soon. Build your own Dornburg Castle(Schloss Dornburg). 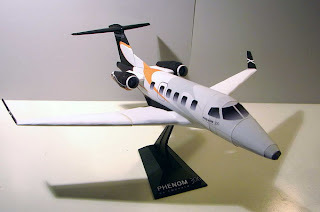 This papercraft model is in 1:130 scale(60 cm high, 20 cm wide and 25 cm deep). Click "Bastelbogen) to find the 13 pages of parts. The Kliment Voroshilov (KV) tanks were a series of Soviet heavy tanks, named after the Soviet defense commissar and politician Kliment Voroshilov. You can download the highly detailed KV-2 Gigant and KV-2 with M-1 turret at 1:25 scale. 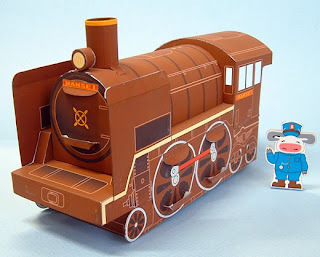 The Niku-Mansei site had added a simple locomotive(kikansha) papercraft. 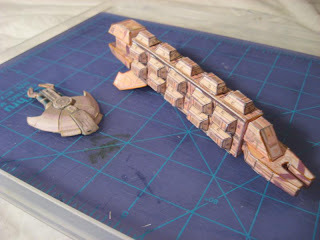 Here's a new papercraft site from Kal. 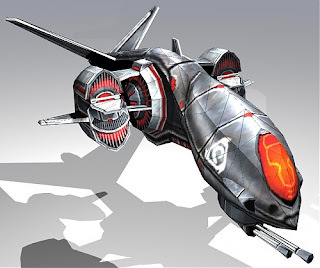 You'll find a Dagger ship and several equipment models from the space trading and combat simulation video game "Freelancer." There's no instructions but you can use the pictures as reference. Here's a site featuring lots of campers and RVs(recreational vehicles). 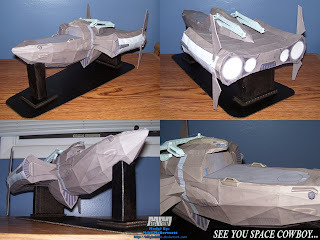 These campers and trailers can cost hundreds of thousands of dollars in real life so building a paper model is the only way for me to have one. The files are in lzh and .exe(self extracting) formats. 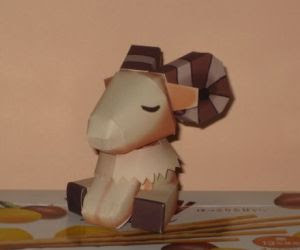 Check out this cute goat papercraft from the MMORPG Ragnarok. This model comes in a pdo file and has one page of parts. It stands at 6 cm. high. 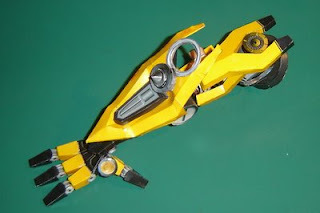 Claudio has just posted the arm templates of Bumblebee. Each complete arm has 11 articulated joints. Shoulder and elbow joints have two possible moves each.